a. Who is the speaker in the poem? b. Why did Tom Dacre cry? c. What is Tom's hair compared with? d. How did the speaker console Tom? e. What did the angel do in the dream? This morning the city of Paris looks slightly fuming; the sky is overcast, and it is drizzling too. But it does no harm to me. I have decided to go out for visit or an observation tour. I had asked Nirmal bhaai for a list of Museums in the vicinity of Paris yesterday. He brought me some brochures with the names and addresses, and street maps of Paris Museums in the evening. Paris has more museums than temples and gods in Kathmandu, he says. I am new to Paris, staying here for only one week. Hope these maps and brochures will show me Paris metro zones and guide me to some museums today. Last week Nirmal bhaai showed me Pompidou Centre, 'a complex building of high-tech structure'. This visit has emboldened me to explore further. I guess I can cover a maximum, of two museums today. It means just giving a cursory glance. This is my plan. They say Cezanne is quite far away, Paul Cezanne, the post-impressionist painter, may be in the outskirts. I cannot visit him all alone, and cannot cover two museums in a day. So I chose to visit a museum nearby in the heart of the city. Likewise, Braque is far, Du Champ is farther away. So, I have decided as per Nirmal's suggestion to start with Rodin's. Maybe I will go to Monet's next. a. The weather of the morning was pleasant for the visit. b. Nirmal bhaai provided great support to the writer. c. Paris is the city of many gods and temples. d. The writers plans to visit three museums a day. e. The museum of Paul Cezanne probably the furthest. a. How did Nirmal bhaai help the writer? b. How are Kathmandu and Paris compared in the text? c. How long is the writer staying in Paris? d. What encouraged the writer to explore further? e. Why can't the writer visit Paul Cezanne? Applications are invited from qualified, experienced, dynamics, smart, result oriented and self motivated Nepalese citizens for the following positions. Interested candidates should apply with detailed Bio-Data, recent PP size photograph along with two references and copies of relevant documents and proper daytime telephone contact no. to the following address by 12th April 2019. Please mention the post applied on the envelope. Those candidates who applied previously need not apply. a. 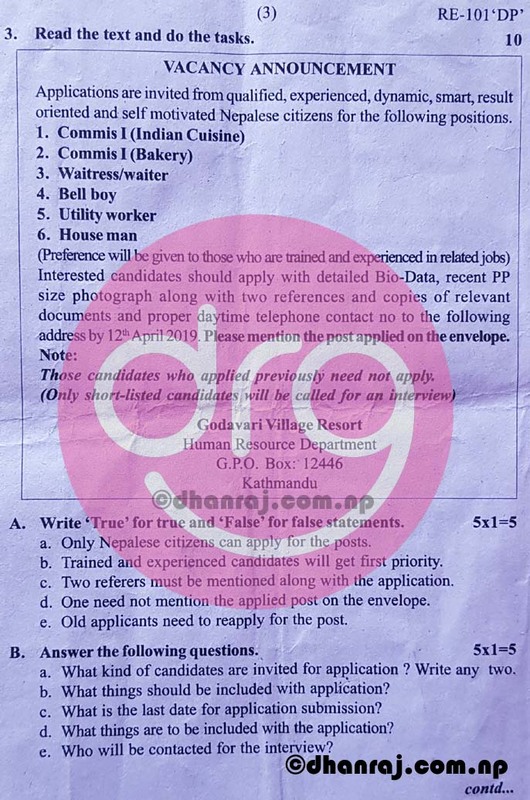 Only Nepalese citizens can apply for the posts. b. Trained and experienced candidates will get first priority. c. Two referrers must be mentioned along with the application. d. One need not mention the applied post on the envelope. e. Old applicants need to reapply for the post. a. What kind of candidates are invited for application? Write any two. b. What things should be included with application? c. What is the last date for application submission? 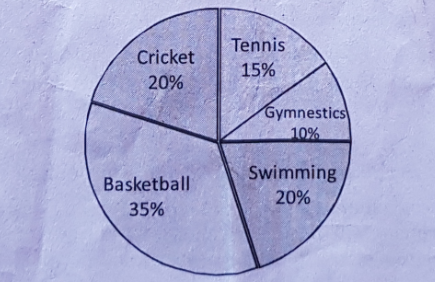 d. What things are to be included with the application? e. Who will be contacted for the interview? POKHARA. The tourism scene in Pokhara swayed between on-season and off-season until a decade ago where in March, April, May, October, November and December were considered to be peak seasons while the rest of the months witnessed a slack in terms of incoming tourists in the lake-city. However, of late, the influx of tourists remained untouched by the set definition of peak and slow seasons, further encouraging travel and tourism entrepreneurs here. Keeping the current trend in mind, tourism entrepreneurs are looking to project and establish Pokhara as a shout after destination for celebrating Christmas and New-Year. In the same line, preparations are currently underway for organizing Pokhara street festival here in the city. 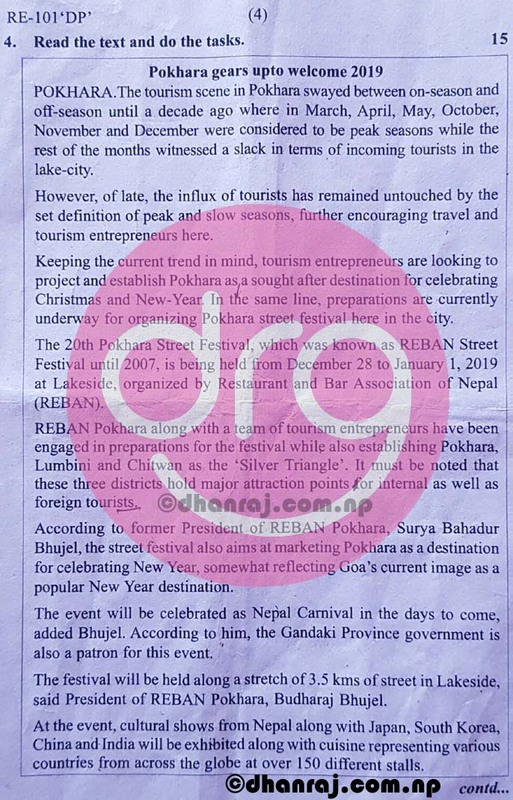 The 20th Pokhara Street Festival, which was known as REBAN Street Festival until 2007, is being held from December 28 to January 1, 2019 at Lakeside, organized by Restaurant and Bar association of Nepal (REBAN). REBAN Pokhara along with a team of tourism entrepreneurs have been engaged in preparations for the festivals while also establishing Pokhara, Lumbini and Chitwan as the 'Silver Triangle'. It must be noted that these three districts hold major attraction points for internal as well as foreign tourists. According to former President of REBAN Pokhara, Surya Bahadur Bhujel, the street festival also aims at marketing Pokhara as a destination for celebrating New Year, somewhat reflecting Goa's current image as a popular New Year destination. The event will be celebrated as Nepal Carnival in the days to come, added Bhujel. According to him, the Gandaki Province government is also a patron for this event. The festival will be held along a stretch of 3.5 kms of street in Lakeside, said President of REBAN Pokhara, Budha Raj Bhujel. At the event, cultural shows from Nepal along with Japan, South Korea, China and India will be exhibited along with cuisine representing various countries from across the globe at over 150 different stalls. a. The number of tourists has remained untouched by .......... lately in Pokhara. b. The tourism entrepreneurs are planning to develop Pokhara as .......... place for celebrating Christmas and New Year. c. Pokhara is one of the major .......... for internal and foreign tourists. d. The street festivals will be celebrated as .......... in future. e. The street festivals will be held within .......... in Lakeside. a. Which months are considered suitable to visit Pokhara? b. When is the 20th street festival being held? c. What does the 'Silver Triangle' refer to? d. What is Pokhara compared with as a tourist destination? e. Which foreign countries are participating in the cultural programme? Govinda Satyal - talented and hard-working student - all proud of him - wish him further success. e. Amrita said to me, "Please help me". Once there lived three artists in a famous city. They were famous for their art. They claimed that they (a) .......... (are/were/have been) perfectly skilled. Each praised oneself claiming he was the best (b) .......... (in/between/among) them. One day they decided to have (c) .......... (a/an/the) fair competition to find out who the best was. There (d) .......... (is/was/were) a good prize for the winner. A judge was also (e) .......... (appoint/apointing/appointed) to decide the case. The competition started on time. One artist painted flowers. The second painted a fruit and third painted a curtain. All their paintings (f) .......... (is/are/were) observed and evaluated by the judge. First he observed the flower in which a bee was sitting. Then he observed the fruit (g) .......... (who/where/which) an ox tried to eat. Both of the pictures looked natural (h) .......... (haven't they/wasn't it/didn't they)? He praised them. Then he observed the curtain. It was so natural that he tried to pull it (i) .......... (to enter/entered/entering) the room. The judge realized that the picture of the curtain was the most natural among them. The judge declared the third artist the winner. This was how his art (j) .......... (get/getting/got) awarded. 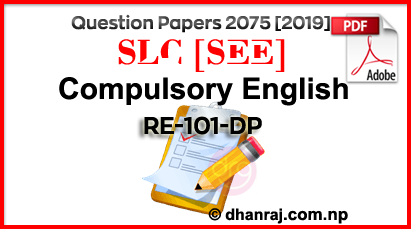 0 Response to "Compulsory English Question Paper | 2075  | RE-101DP | SEE"